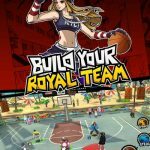 Want to get in on the NBA playoffs fever without playing an especially detailed or intricate mobile game? 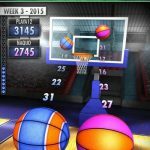 Real Bouncy Basketball is an iOS game from Anders Lundbjork that adds to the growing number of casual basketball games for the mobile space. Lundbjork describes the game as a “one-button, 2D physics-based, pixel art basketball game,” where you can shoot regular two-pointers or step out for three-pointers, beat the buzzer with last-second shots, or perform “breathtaking, screen-shaking” dunks. You can play one, two, three, or four quarters varying in length from 30 to 90 seconds, and unlock and play as many as 30 real-life NBA teams. You can customize teams and choose your own players, and compete against the game’s AI or against other human players. Basically, it’s two-on-two basketball not unlike NBA Jam, but with its own special twists and a more casual set of mechanics for mobile. And, as some say, it’s quite a funny game when it comes to the physics. Don’t let this game frustrate you, though, and check out this list of Real Bouncy Basketball tips and tricks to help you win more games. If you’re familiar with the rules of basketball, this should need little explanation, but just in case you aren’t, we’re giving you this tip anyway. Shooting from your side of the court beyond the outermost line counts as a three-point shot. Shooting inside that line would be good for a two-point shot. Basically, you’ll score more points if you shoot from farther off to the basket. Talking about the game’s mechanics, you can jump higher by holding longer onto the jump button. Use this to your advantage when trying to shoot three-pointers; unlike in real life, it’s best to jump as high as possible when aiming for a trey. But don’t just jump as high as you could; also pay close attention to the jump button. There’s a cool down for each jump, and if you try to make another jump before the cool down is over, you won’t jump as high as you previously did. Wait until the jump button refills and the cool down ends before trying again, and you’ll be fine. 3. When Should You Shoot? It’s not just jumping where you need to make sure your timing is on point. You should also make sure you’ve got your timing down pat when attempting your shots, and the best time to fire off a shot would be at the apex of your jump. Again, jumping as high as possible means a lot here, so is the importance of jumping when the jump button is fully charged. If you’re currently holding the ball, wait for the button to recharge, hold on for a high jump, and release the button once your jump has hit its peak. As long as no one is playing tough defense on you, you’ll be able to make majority of your shot attempts. Want to hit the most spectacular shot possible in basketball that isn’t a buzzer-beater? Try for a slam dunk by positioning yourself right under the hoop. Jump while you’re under the hoop and you’ll be able to score on a slam dunk. Not only do you get points for a dunk, you’ll also look pretty stylish while doing it. And, just like in real life, you just might be able to psyche out a human opponent or two. You know what we often say in our game tips and tricks, right? 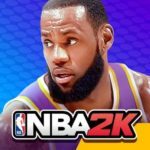 The best offense is a good defense – it applies in real life, and it applies in a lot of mobile games, including basketball games. In Real Bouncy Basketball, your players will keep holding their arms up high on defense if you’ve got the button held down. If you time your jumps properly, you’ll be able to block your opponents’ shots, but you should also be on the lookout for your opponents trying to block your own shots. In order to throw off opponents who are going for a block, try for a fake, which is where you’re ostensibly going for an early shot, but drawing back eventually. Once your defender’s feet land on the court, go for a shot and you’ll be able to get it up without any defense standing in your way. Aside from blocking shots, stealing the ball is a good way to clamp down on defense. And here’s how to steal the ball from your opponents’ players. If your hands accidentally bump into the ball while it’s in your opponent’s possession, that won’t count as a steal. So, in this case, tap the button ever so quickly so that your players raise their hands slightly; if your player collides with the ball, that’s when it will count as a steal. 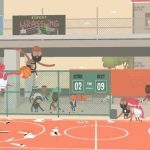 These would be our tips and tricks for Anders Lundbjork’s new mobile game, Real Bouncy Basketball. If you’ve enjoyed this guide, or know some hints, that we haven’t included in this list of tips and tricks, be sure to let us know!